NEW YORK – Christie’s New York announces highlights of its upcoming Important Jewels auction on October 22. With 350 jewels on offer, the sale features an array of colored and colorless diamonds, rare gemstones, and signed jewels – led by a magnificent rectangular-cut potentially internally flawless diamond pendant necklace of 81.38 carats. Estimates range from $3,000 up to $4 million, and the total sale is expected to achieve in excess of $30 million. 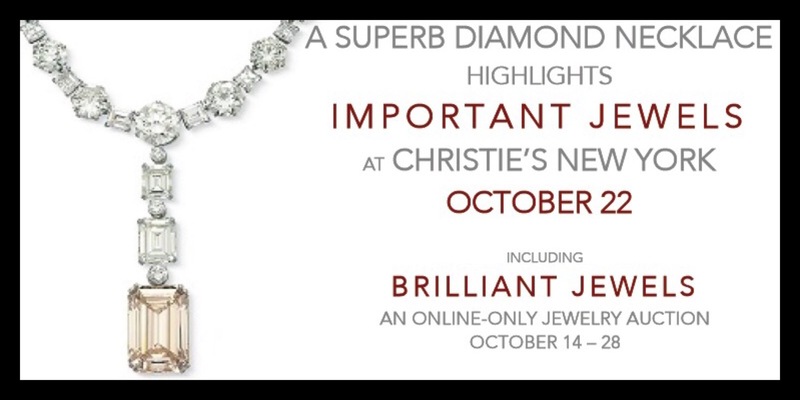 In the first half of 2014, Christie’s International Jewelry department achieved their highest ever half-year result at US$362 million and established 8 new world auction records. The May 14 Magnificent Jewels auction at Christie’s Geneva saw the highest total ever achieved for a jewelry auction at US$154 million that included the record-breaking WINSTON BLUE diamond (US$23.8 million), which set a new world auction record price per carat for a blue diamond at US$1.8 million per carat.